Ladies this one is for you. Yesterday, my really good friend, Guchi, and I were arguing yesterday about our idea of an ideal first date. We were torn between two options. 1. The traditional dinner date? I went for option 1 because I feel like it would help me get to know the person so much better than going on an adventurous date. For one, with my curious personality I never run out of questions to ask my date. I just feel like I need to know a person to a certain degree that I am comfortable with before doing something adventurous with them. For example I went on an adventorous (rock climbing) first date once, although I liked it, I didn't get me to know the person more. Instead we ended up talking about rock climbing the whole time. However, Guchi disagreed with me and went for option 2. She felt that a traditional dinner date is really fake. Her main points were that, firstly, picking a dress for the date can be a hassle. Then when you finally find a dress to wear, choice of make up becomes a problem. Loud vs soft everyday makeup? Hmm...Ok then you're all set and you get to the restaurant. Now, if you're a village girl like me, you might not know how to pronounce some things on the menu..lol. When u finally attempt to, you might pronounce the name wrong. Mind you, your date is taking note of all these things. 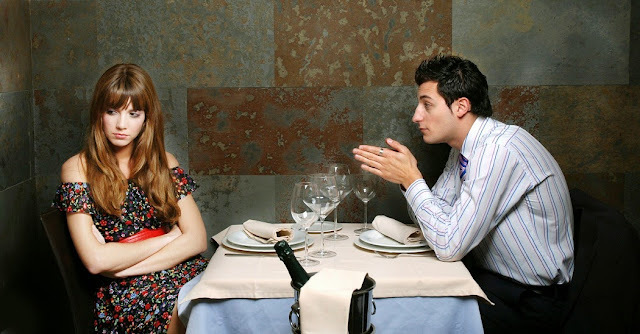 Then finally when your food gets there, you have to eat "like a lady", and at the same time carry out a conversation with your date so things don't awkward. At the end of the day you have spent the whole time being 'fake' and your date doesn't get to know the real you, compared to an adventurous date where you can't really pretend to be who you're not and your date gets to see your real emotions, and conversations don't have to be forced. You made very solid points, however I feel that going on an adventurous date with someone you just met is invading into your personal space. Plus you haven't gotten to know them yet so you might be quite uncomfortable carrying out the adventure that comes with the date. I feel like its a lot more engaging when there is no pressure of doing any other thing other than just talking to the person one on one. I'll go with an adventurous first date then a traditional second date because by the second date I'll be a bit more relaxed having already being around the person and stuff. I'm a bit shy so jumping straight into a one on one soul talk first date might not work out well. I kind of agree with you. But if you are shy talking one on one with someone you know nothing about how comfortable will you be actually going on an adventure with them? I would freak out and think they are trying to harm me or something when I am not looking. For example I went on a dinner date once well more like a date at the bar and this guy was so nervous and weird, he made me so uncomfortable and I mostly did all the talking. The whole time I knew at the back of my mind that this wouldn't work. So imagine I went on an adventurous date with him first, that would have been awful. I just really need to know where your head is at first. I'll go with the traditional date first. At this date im trying to see where your mind is at, what type of person you are...etc. I guess some people will call it getting to know the person better. I enjoy meaningful conversations and i'll love to have those with my date before I feel comfortable around you to go on an adventurous. Thank you Ife. Yes I agree with you a 100%. I would like to know the kind of person you are to see if I am even okay with sort of entrusting my life in you hands (assuming if we go on like a kayaking date). So for me traditional dinner date works. That way I can find the quickest excuse to leave if you're boring me out. I will go with adventure, all your friend listed are me. As a confirm village girl i will rather go climbing trees than trying to be fancy and lady like lool. hahahhaha village geh things..lol nothing wrong with that and sticking to what you know! I don't like the traditional ist dat, I will prefer an adventurous one. Just so it give me more insight to who am going out with. thank you for agreeing with me. I definitely need to get to know you on a personal level first before we can go on any adventures. I will go with the first option, I like to read people, and get to know them from your eyes to your body language. Great post dear. yes!!! I absolutely agree I need to study and observe you first. Thank you. I say traditional date.. FIRST. Reason why is because if you're doing something like rock climbing when are you getting a chance to talk and get to know each other? I want to know who I'm dealing with and if we go to a dinner and have nothing to talk about.. that pretty much answers everything for me. Thanks Ash! your response is so spot on. I love creativity in a person so if he is able to get creative with where he takes me to on a traditional date, that already kind of tells me he is a keeper. And I agree with you on if we don't have anything to talk about on a dinner date that already tells me we can't go on an adventure together.